In contradiction of the Government White Paper issued on July 10th 1984 which claims that “the troops exercised great restrain and refrained from directing any fire at Harmandir Sahib” (paragraph 10), Citizens for Democracy records the evidence of Harcharan Singh Ragi, who witnessed his guardian and mentor – the old, completely blind, Head Ragi of Harmandir Sahib (Golden Temple), Amrik Singh being shot by an army bullet and dying inside the Harmandir Sahib at about 6.30 a.m.
an lawyer, civil rights activist, and a distinguished judge. A day after publication of the report it was banned and confiscated, the authors were arrested and charged with “sedition” (incitement of rebellion against a government); http://www.pucl.org/admin/know_pucl.pdf. 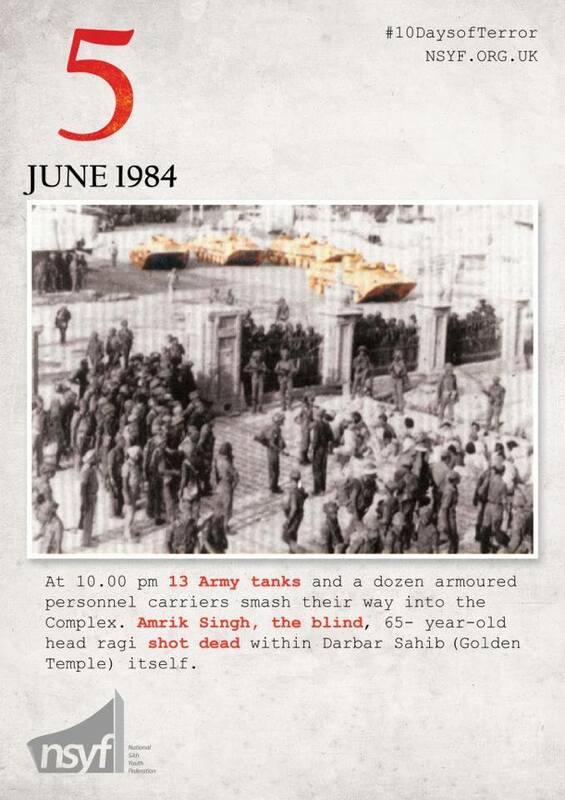 Eyewitness Subhash Kirpekar writes that in total there were approximately “a dozen tanks and a dozen APCs in all” (Armoured Personal Carriers); “Operation Bluestar, an Eyewitness Account” (published in The Punjab Story). Giani Puran Singh recounts how “a vigorous battle ensued between the Army and the 40-50 youth who had been holding the forces fought bravely through the night, until they either they were killed or their ammunition was exhausted”. Previous post Jammu police have shown their barbaric face; human being is killed for demanding his rights?